I am a salad person, and I love a good Caesar salad. My mom makes a fantastic Caesar salad, and I knew Alton’s recipe from Good Eats was going to have its work cut out for it to rival Mom’s recipe. In both watching the episodes and reading the online recipes from the show, I have learned that subtle differences often exist between how Alton prepares the dishes on the show and the recipes posted online. I choose to follow what Alton does on the show when there are any differences. My mom often made homemade croutons when we were growing up, so I am slightly biased when it comes to store-bought versus homemade croutons. Really, there is no comparison. 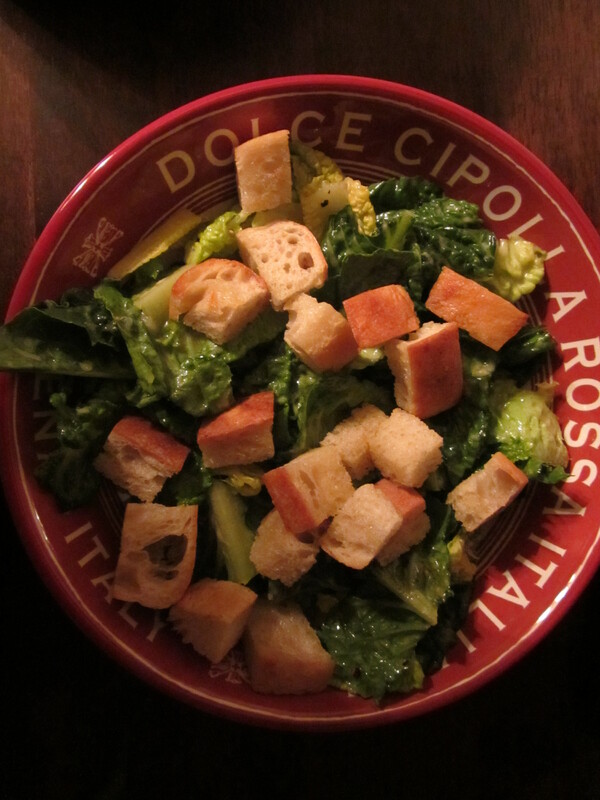 For my croutons in the Caesar, I used a store-bought loaf of Pugliese bread. 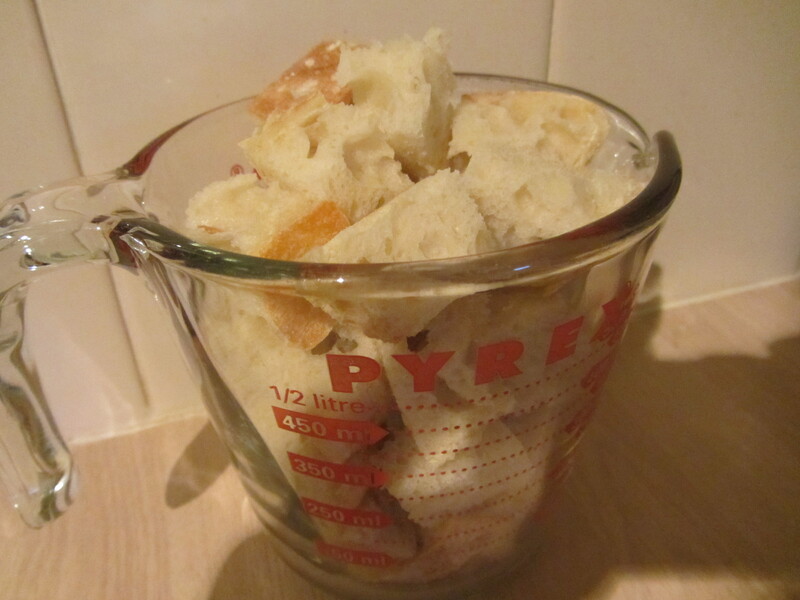 It was not day-old bread, but the croutons still managed to dry sufficiently in the oven. 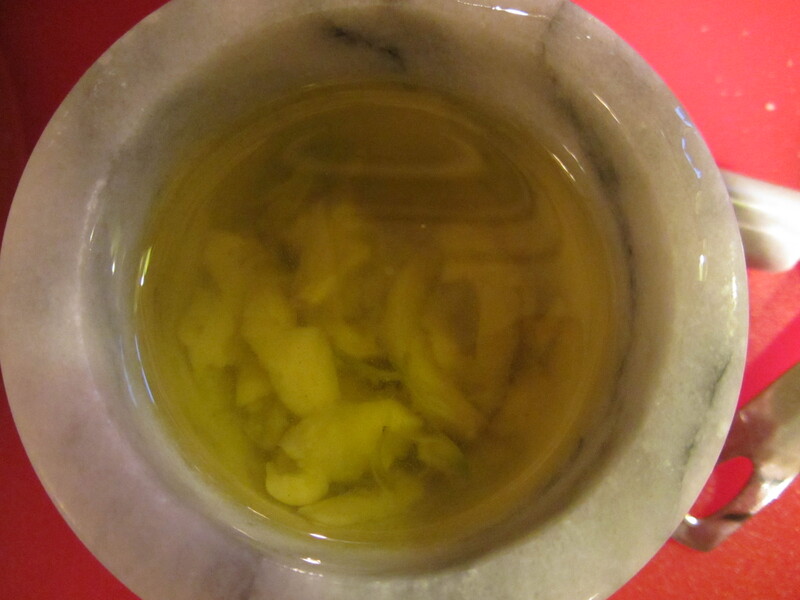 Alton was right… tossing the crispy bread cubes with the hot garlic-flavored olive oil definitely made my mouth water! Garlic, olive oil, and salt. 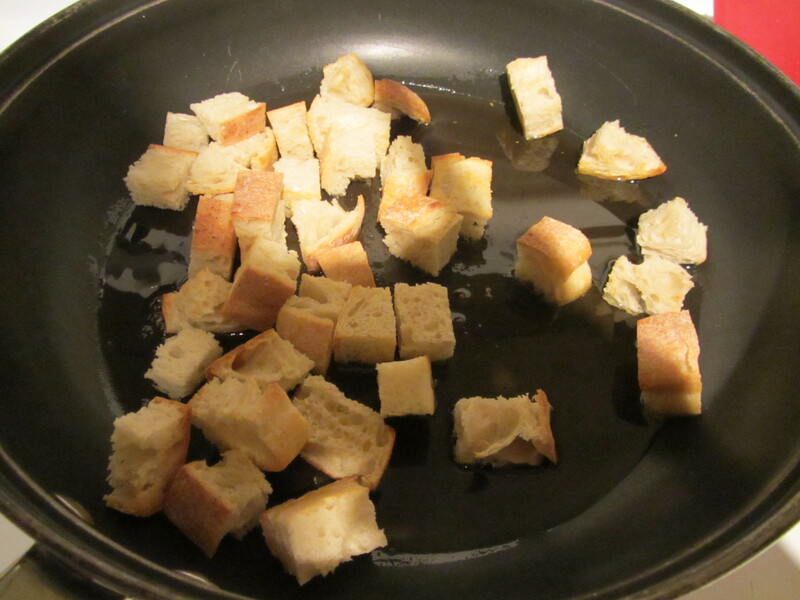 Croutons tossed in garlic oil. 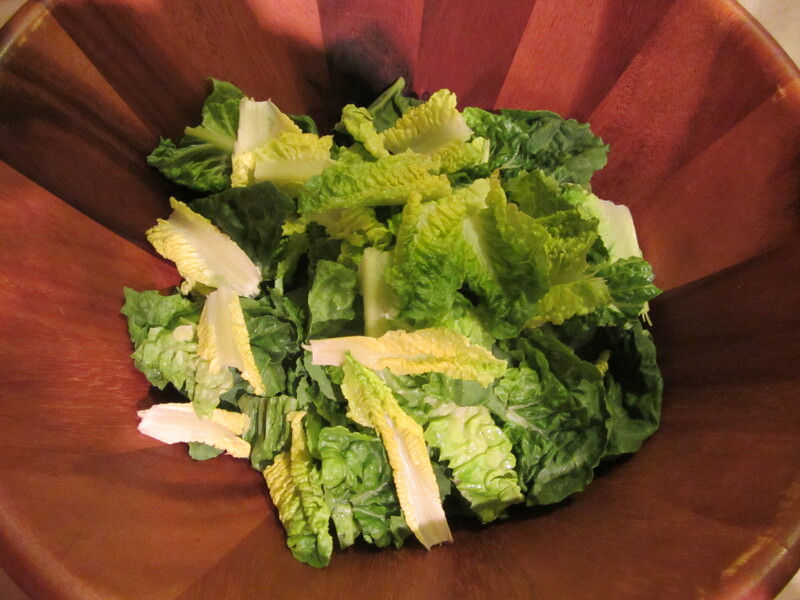 I used two hearts of Romaine that were pre-washed and bagged, as our salad spinner (the same one Alton recommends on Good Eats) died in a tragic accident on a hot stove years ago. 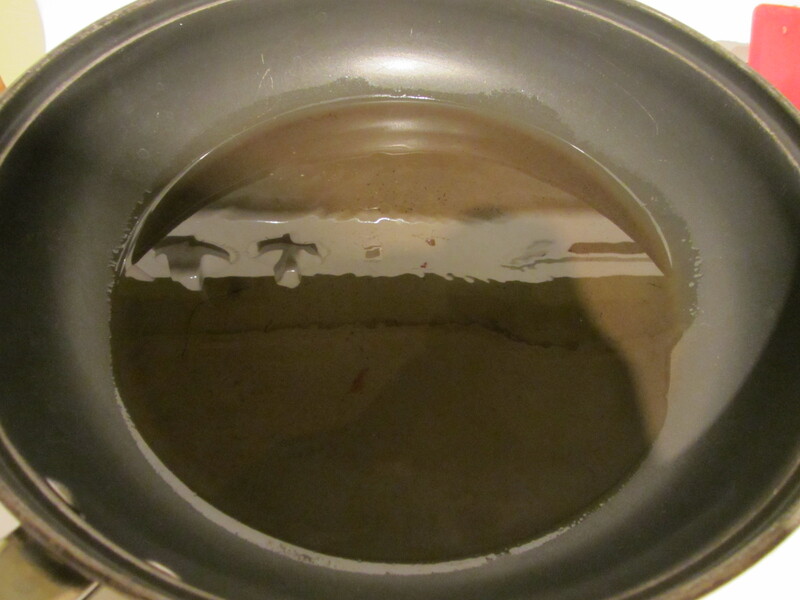 Note: Do not place your clean plastic salad spinner on the stove to air dry without checking the burners first. 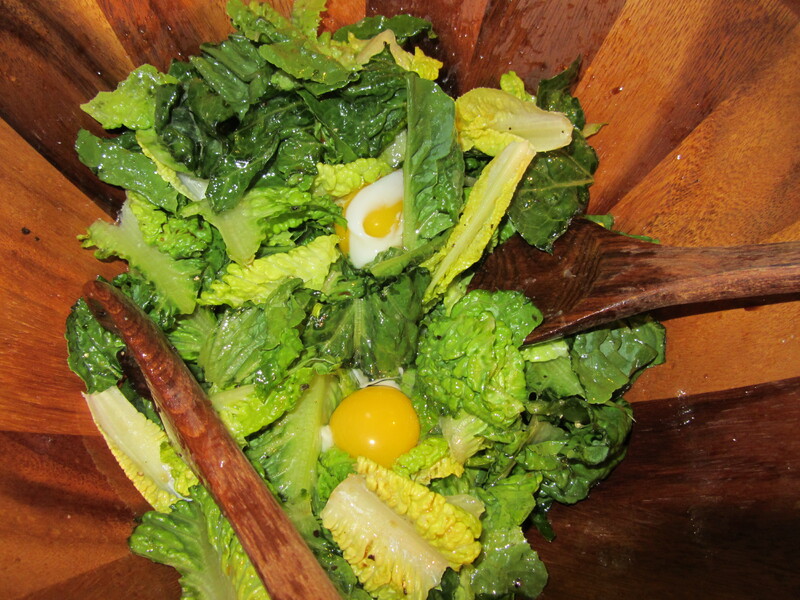 Following Alton’s recipe, I cooked my eggs for one minute, and gradually added the dressing ingredients to my lettuce, tossing after each addition. 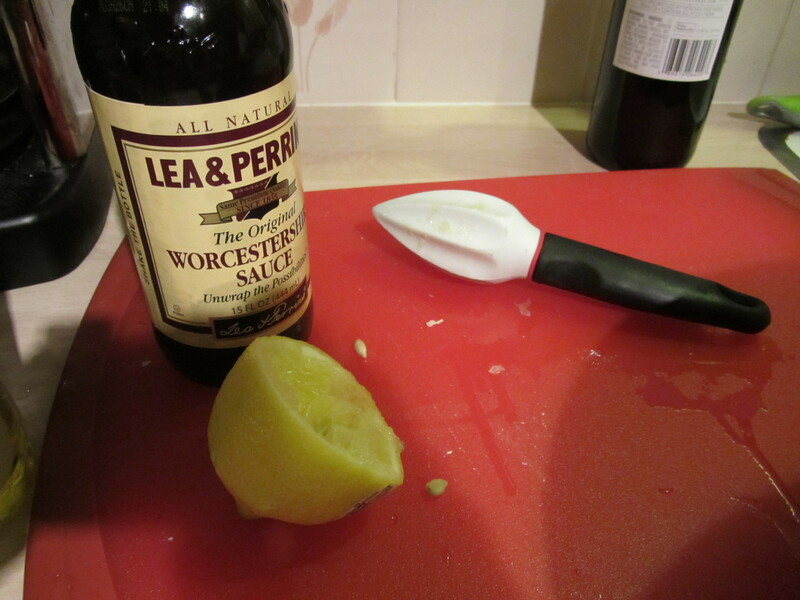 I did like the flavor of the Worcestershire sauce in the dressing, though I’ll admit I have also had Caesar salads with anchovies that I have enjoyed. Adding the barely cooked eggs to the dressing made a creamy dressing that thoroughly coated the greens and paired nicely with the crunchy garlic croutons. All in all, I thought this was a very good Caesar salad. Was it as good as Mom’s? Sorry Alton, but I think hers still wins. I tend to like my salad dressings on the savory, tangy, acidic side. 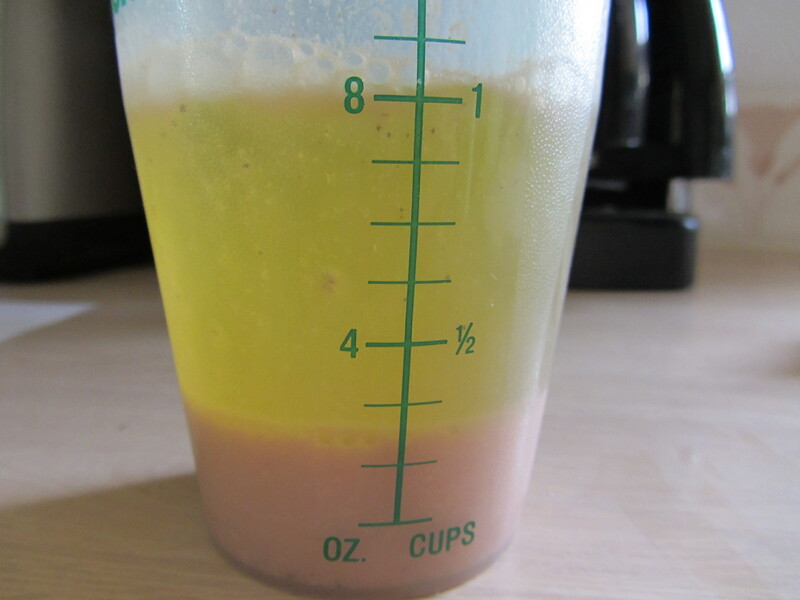 Fruity, sweet salad dressings just usually are not my favorites. 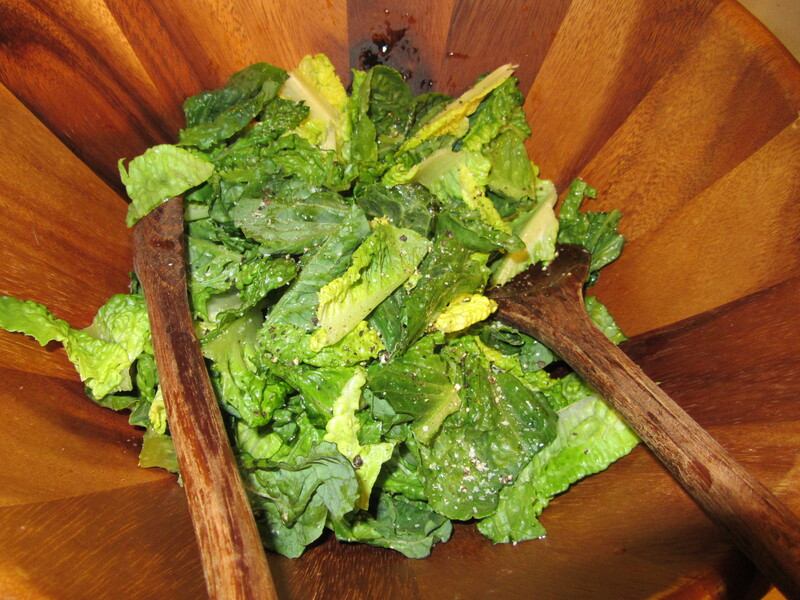 Often, I just drizzle olive oil, vinegar, salt, and pepper straight onto my greens. Alton’s vinaigrette recipe reminds me somewhat of my grandmother’s spinach salad dressing, so I knew I would like this salad dressing before I even tried it. 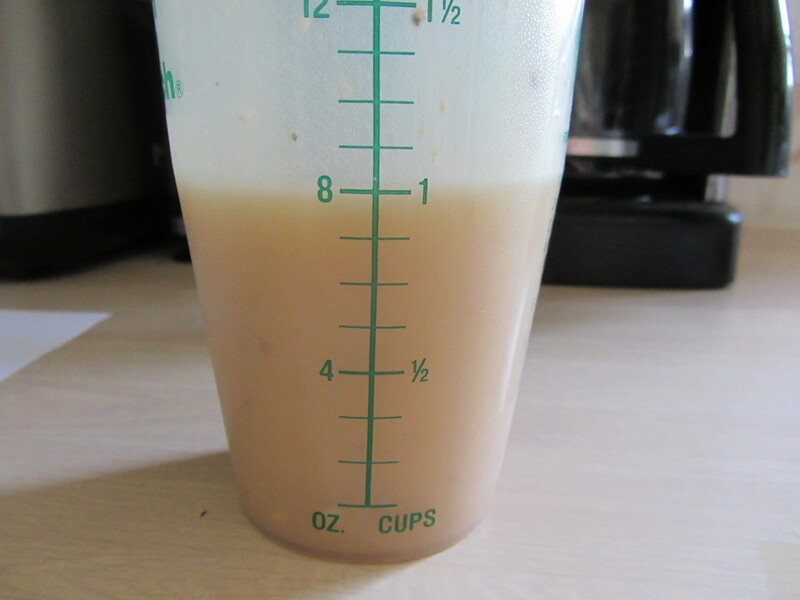 Per Alton’s instructions, I first combined my vinegar, mustard, garlic, salt, and pepper. 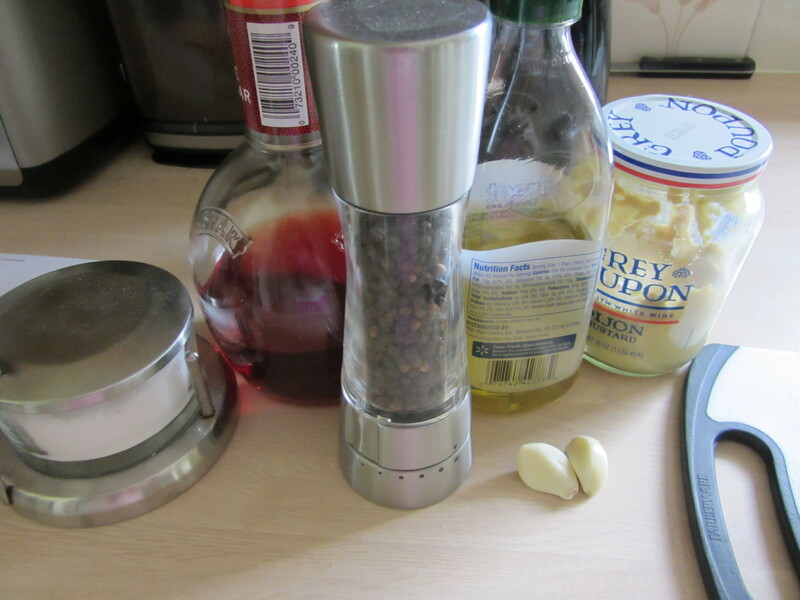 Combination of vinegar, mustard, garlic, salt, and pepper. 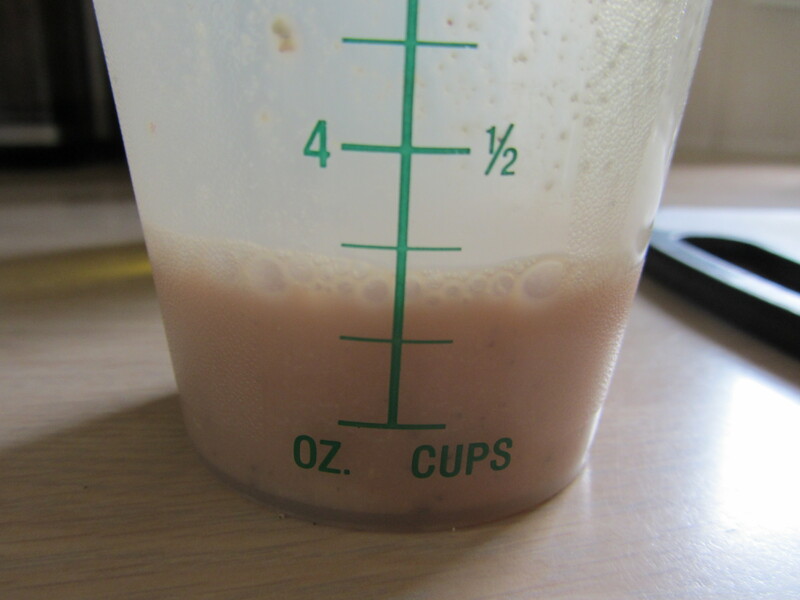 I then added my olive oil and shook the dressing until it was well emulsified. I left mine at room temperature for a few hours before having it on a lunch salad I made with tomato, marinated artichoke hearts, cucumber, kalamata olives, walnuts, avocado, and fresh parmesan. Olive oil added to other ingredients. The result was a bright, acidic, tangy dressing that would brighten up any plate of greens, and you can throw it together in a matter of minutes. Why buy salad dressing when you can make something so much better at home?